The Web.com Tour Finals enter the third of four tournaments this week with the Nationwide Children’s Hospital Championship in Columbus, Ohio. 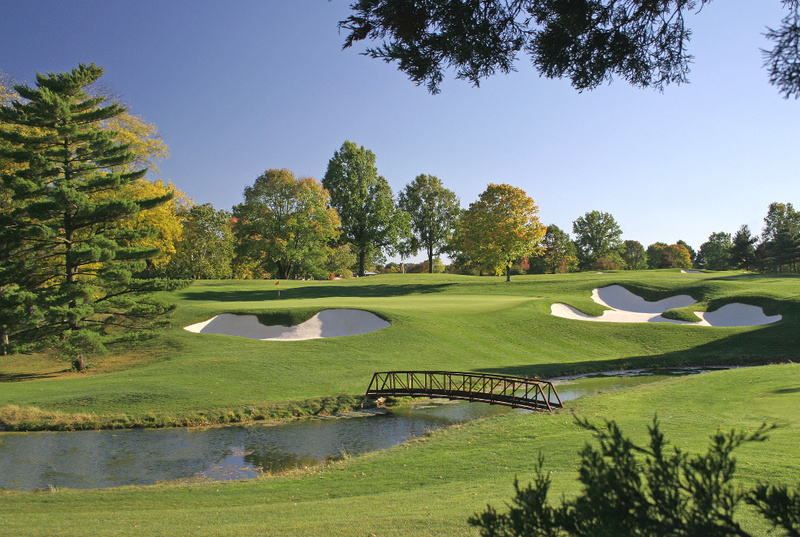 The highly rated Scarlet Course at The Ohio State University Golf Club, redesigned by Columbus native and Ohio State alumnus Jack Nicklaus in 2006, will host the season-culminating series. Fans can watch tape-delayed coverage of the tournament on Golf Channel today from 6:00 p.m. to 8:00 p.m. EST and Friday from 8:30 p.m. to 10:30 p.m. EST. Live coverage picks up Saturday from 4:00 p.m. to 6:00 p.m. EST and Sunday from 1:30 p.m. to 4:30 p.m. EST. Together, the four Finals events will determine who earns the second set of 25 PGA TOUR cards for the 2015–16 season, as well as set the priority-ranking positions for all 50 card earners. The Finals got underway September 10th with Henrik Norlander winning the Hotel Fitness Championship, sparked by a course-record 62 in the final round at Jack Nicklaus-designed and renovated Sycamore Hills Golf Club in Fort Wayne, Ind. The second event played out last week in the Small Business Connection Championship at River Run in Davidson, N.C. Chez Reavie won the event, becoming No. 1 on the Finals’ 25 money list. The Nationwide Children’s Hospital Championship has been a fixture on the Web.com Tour since 2007 and a Finals event since the series was instituted in 2013. It has raised $4,475,000 in support of the Hospital’s pediatric cancer program. Nationwide Children’s Hospital is also supported by the Memorial Tournament, the Nicklaus Children’s Health Care Foundation, and the Nicklaus family. Alister MacKenzie, the architect of Cypress Point and Augusta National, designed Ohio State’s Scarlet course in 1931 but died in 1934, before ground was broken. Perry Maxwell oversaw the construction, which was completed in 1938. Ohio State legend Jack Nicklaus returned to renovate the course, concentrating on restoring the course to the way MacKenzie originally intended it to play. The Golden Bear’s improvements included restoring the bunkers, lengthening the course to 7,455 yards, and changing par to 71. The redesigned course—which Jack jokingly referred to as a “Nick-enzie”—was named to Golf Digest’s Best New Private Remodel list. The Scarlet Golf Club has also topped rankings of the best collegiate courses. Nicklaus played collegiate golf at Ohio State until turning pro in late 1961. The OSU campus is home to the Jack Nicklaus Museum, a 24,000-square-foot educational and historical facility, housing cherished mementos from the Golden Bear’s record-setting career. NOTE: Web.com Tour players Nos. 1–75 are in bold. PGA TOUR players Nos. 126–200 are unbolded. Those in italics are either nonmembers who earned enough equivalent FedExCup points to finish 126–200 (N-M) or PGA TOUR players with medical exemptions (Med) as noted. 1. Field size was 131 players as of 5 p.m. ET, Friday, September 18th. The following players finished 126–200 in FedExCup points but are otherwise exempt on the PGA TOUR and will not play in the Web.com Tour Finals: Will MacKenzie, Scott Stallings, Jamie Donaldson, Seung-Yul Noh, Whee Kim, David Toms, Blayne Barber, Charlie Beljan, K.J. Choi, Geoff Ogilvy, Graeme McDowell, Ernie Els, Shane Lowry, Steve Stricker, Tiger Woods, Angel Cabrera and Ben Crane. Patrick Rodgers (via FedExCup points) and Cameron Smith (via the money list) are exempt, having earned their PGA TOUR cards as Special Temporary Members this year. Justin Leonard has opted to take his one-time career money exemption in 2015–16. Martin Kaymer and Victor Dubuisson are not eligible for PGA TOUR membership in 2015–16.